Some people prefer motorcycle gear that doesn't make them look like a Power Ranger, but not you. No, you like to be protected and look like you've just been fighting evil aliens at the same time. Luckily, Alpinestars makes defeating Putties look like a walk in the park. 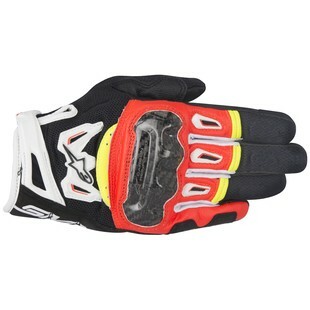 Enter the Alpinestars SMX-2 Air Carbon V2 Gloves. All the style of high end race gear, but in a lightweight and affordable package that'll keep you cool in the heat of summer. h make up the rest of the glove, providing solid build quality and a ton of breathability. Pre-curved fingers and stretch paneling will make these the most comfortable Air Carbons yet, while touch-screen compatible fingers allow you to Tweet about just how awesome your new gloves are. Not to be outdone, Alpinestars even added grip panels on the palm and thumb to make sure you don't slip from your controls. While not the beefiest of sport gloves, sometimes staying cool is more important than wearing tanks on your hands. When you want to beat the heat, be protected, and look good doing it - there are few better choices than the Alpinestars SMX-2 Air Carbon Gloves.